Belmont Stakes winner and millionaire Tapwrit has been retired from racing and will enter stud at Gainesway for a $12,500 stud fee in 2019. It's too bad that the colt didn't return to winning form as a four-year-old. I know they tried, but it was like he just never got that spark back. It will be interesting to see if he's supported as a stallion. Yes, he's a reasonably-priced Tapit, attractive and out of a nice female family, but if I wanted a Belmont-winning son of Tapit, I guess I'd prefer Tonalist. $12,500 is pretty reasonable for Tapwrit, considering how good he was as a 3 year old and the pedigree. Kind of surprised they didn't make it $25K. $25,000 would be way way overpriced. He only won the Belmont and the Tampa Bay Derby. Sometimes its best to start lower, handpick mares and then raise later if the horse proves worth it. No, $12,500 is reasonable at this point. He’s not done much this year, and winning the Belmont isn’t like winning the Met Mile. His biggest attraction is being a son of Tapit - and there are a few of them to choose from! In an article on BH about Uriah St. Lewis and Discreet Lover, Uriah said that before the JCGC Taylor Made and Woodford had already conversed with him about a stud deal whenever he retires. Didn't expect that. Agree. $25,000 would be ridiculous. I'd even suggest they won't even have the luxury of 'handpicking' mares at $12,500. They are going to breed him to anything that shows up in the shed. Lane’s End is really flexing their guns right now with their roster. They've now added West Coast to their arsenal. He looks like he could be popular...great physical, good race record, champion dam, and from one of the most successful sire lines in this country. Secretariat died on this day in 1989 after suffering from laminitis. A few days before, local television personality Bill Lamb was visiting @claibornefarm with his family and shot video what is believed to be the last footage of Big Red. 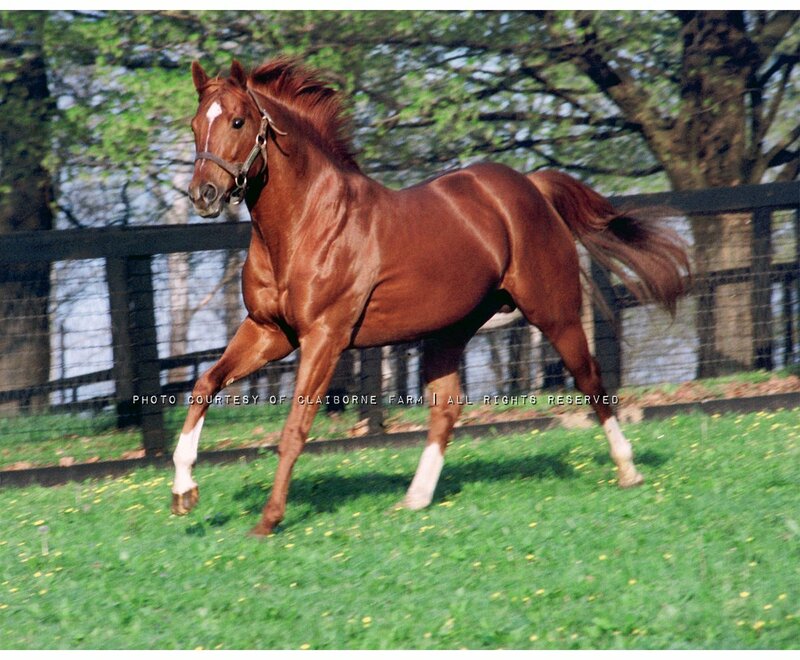 Thank you for posting this...I never tire of seeing photos and videos of Secretariat. They claimed him for $20,000, ran him twice, then retired him. Doesn’t note that. ~ Didn't expect this. Of course unsound horses with few starts seem to be quite popular. I know he was brilliant, but...only three starts? They're going to promote him as 'undefeated,' but how hard is it to stay undefeated if you run only three times? I was a fan of Friesan Fire when he entered the Kentucky Derby, but IIRC, the A.P. Indy son never really recovered from a nightmare trip in one of those muddy, madhouse Derbies. Army Mule looked like a breakout runner for FF, but his truncated career makes it hard to judge just HOW good he really was. Pokes with 10-foot pole. A horse that borders on crippled producing more of the same. Discussion with friends the other day, If Am Ph didn't exist or didn't win the Triple Crown, How would you feel about Justify becoming the first Triple Crown winner in 40 years then almost immediately retiring?